Wednesday, November 24, the Library will close at 5:00 p.m. 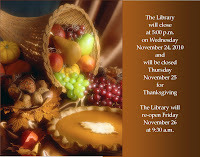 The Library will be closed Thursday, Novermber 25, for the Thanksgiving holiday. The Library will re-open Friday, November 26, at the regular time of 9:30 a.m. The staff and Board of the Roselle Public Library wish all of our patrons, friends and families, a happy Thanksgiving! Your Library is always open at http://www.roselle.lib.il.us!